This Certified iOS App Developer training course will prepare you to become a qualified Apple mobile app developer using the Swift 3 programming language. This iOS course will train you on the ins and outs of the iOS 10 platform, including user interfaces, input restrictions, notifications, messaging and integration with the popular Sirikit. With this iOS App development course, you’ll also gain hands-on experience by developing an app portfolio with the skills you learn. 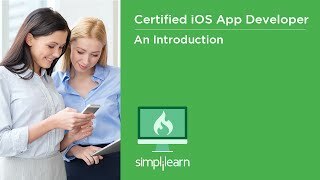 The Simplilearn Certified iOS App Developer course will furnish you with the core skillsets to become an expert in Apple iOS mobile app development. With this iOS developer certification, you’ll learn the core functionality of iOS 10 and how to interact with it using the powerful and intuitive Swift 3.0 programming language. And you’ll get hands-on experience in iOS development by creating your own app portfolio through in-depth projects. There is great demand for mobile app developers who can keep pace with increasingly complex mobile hardware and software platforms, and app developers make an average of 50 percent more than web developers, making this course a requirement for those who wish to excel in the mobile app space. Who should take this iOS App Developer course? What are the prerequisites for this iOS App Developer course? There are no official prerequisites for this course as you will learn iOS app development from scratch. However, basic computer skills are recommended. There are four projects in the course. Each module concludes with a project that puts what you have learned to use, giving you valuable hands-on experience. What is the free course “iOS and Swift Basics”? How do I become a Certified iOS App Developer? Will I get a course completion certificate? To become a Certified iOS App Developer, it is mandatory to complete 85% of the course. We offer course completion certificate after you successfully complete the Certified iOS App Developer training program. Is there a certification exam for iOS app development? No, there is no certification exam for iOS app development. Your published apps on the Apple AppStore will showcase your skills in iOS app development to employers and colleagues.